Spotted this recipe on floridajuice.com. It's easy to prepare and promises to be exceptionally tasty, so I'm passing it on. If you're cooking a single chicken, just divide ingredients by 3. I'll be cooking a single chicken and cutting it up, altho' the recipe calls for a whole bird. By the way, floridajuice.com offers a huge and sortable recipe bank. Recent featured recipes include Orange Mango Lassi, Orange Tapioca Crème Brûlée, and Citrus Flank Steak "Cuban Style" with Mashed Sweet Potatoes. Combine orange juice, soy sauce, lime juice, garlic, cumin, oregano, paprika, pepper, and oil in blender; blend until smooth. 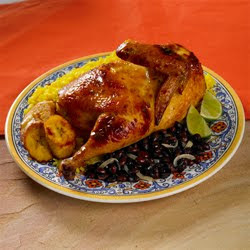 Pour mixture over chicken; cover and marinate in refrigerator for 8 to 24 hours. Discard marinade and pat chicken dry with paper towels. Preheat oven to 450° F. Season the cavity of the chicken with salt and pepper. Tie legs together to hold shape; tuck wings under body. Place chicken in roasting pan. Roast chicken 20 minutes. Reduce oven temperature to 375°F. Continue roasting for about 1 hour 20 minutes or until internal temperature reaches 165° F. Remove from oven and let cool. Place chicken on rods and roast according to manufacturer’s directions or until internal temperature reaches 165° F. Remove and let cool.